A Chartered Land Surveyor with over four decades of land surveying and geospatial engineering, meet Mark Hudson – the founder and Managing Director of Geoterra. 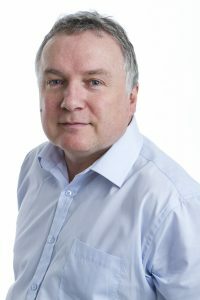 Mark, the founder and Managing Director of Geoterra, is a Chartered Land Surveyor with almost four decades of experience in land surveying and geospatial engineering. He is also regularly called upon to act as a consultant or expert witness. He has worked on some of the most high profile civil engineering, tunnelling and construction projects in the UK, Ireland and worldwide working with clients such as Shell E&P, London Underground, Formula One Administration, Nishimatsu Construction, Tarmac Construction, British Coal and Irish Rail. He is an active member of a number of UK industry professional bodies. As a Fellow of the Chartered Institution of Civil Engineering Surveyors (ICES), Mark sits on the Institution’s Council of Management and is the Regional Chairman for North West & North Wales. In 2010, Mark was awarded the ICES President’s Medal in recognition of his outstanding contribution to the professional body. Mark is a regular commentator in the industry press and a speaker at conferences and seminars.